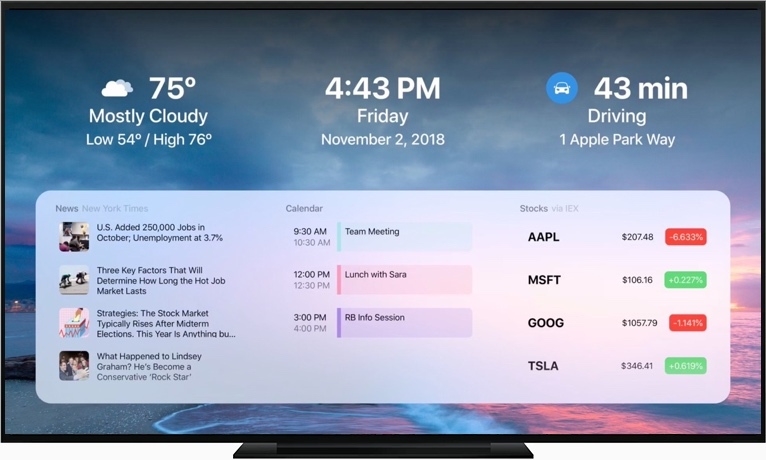 Student and former Apple intern Punya Chatterjee has developed a slick-looking free tvOS app called DayView that acts as a personal dashboard for Apple TV. 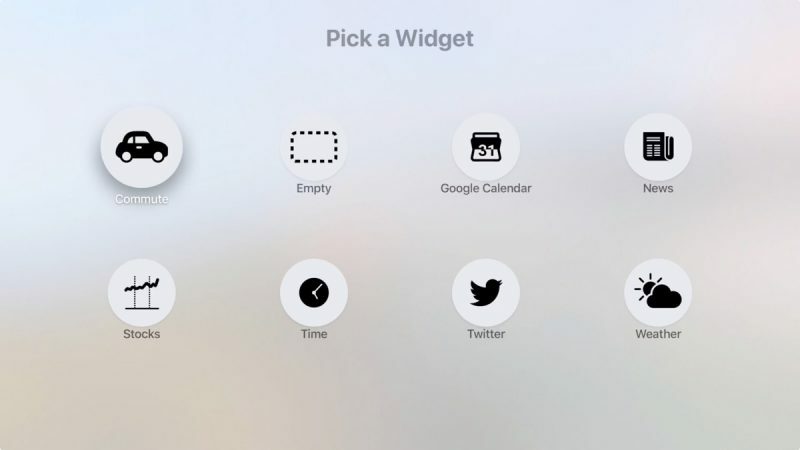 Currently the app includes widgets for weather, commute time, Google calendar, stocks, Twitter trends, and news headlines, but Chatterjee plans to build several more as well as improve the existing widgets, with better dashboard customization options also in the offing. 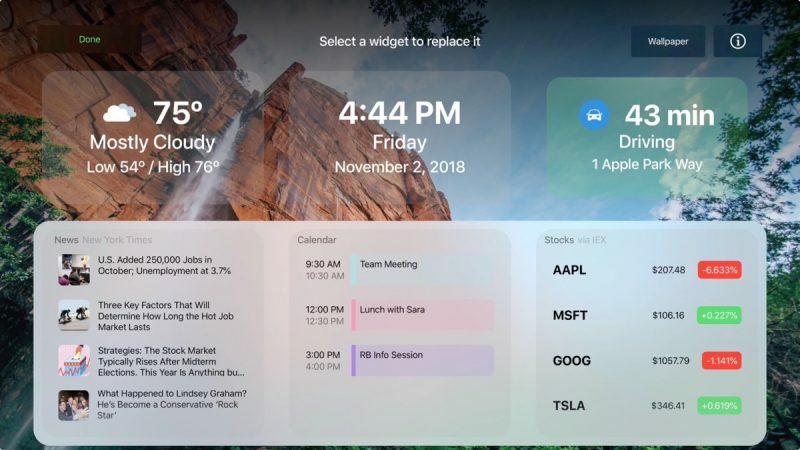 Possibilities for future updates include custom wallpapers, additional news sources for the news widget, HomeKit integration, extra calendar view options, extendable widgets, and more. Apple Calendar support would be an obvious win, but Apple's EventKit framework is currently only available for macOS and iOS, although the developer is looking at alternative syncing solutions in the meantime. This is a really cool idea, and looks great, although I see its limitations on tvOS. I’ve always felt something like this would be nice as a home screen or lock screen on iOS or macOS. Although I don't have current use for the commute and calendar feature, I like the idea and layout of the app. It has potential. I can see why, perhaps, Apple don’t offer this - it would be one less reason to own one of their more capable computers. But that negative could also be flipped to a positive, turning an Apple TV + iCloud dashboard into another reason to buy into the Apple ecosystem. If Apple invested in developing this kind of feature, they could also use it as a basis for addtional small (or large) screens around the home - the idea Amazon and Facebook have recently peddled, but done right. Won't be long before Apple comes out with their own and then bans this app. This cynical but accurate comment about our favorite trillion dollar company reminds me of an old lyric, "in the days when you were hopelessly poor I just liked you more." It's an app, no thanks, although it looks good, the only one which could integrate this is apple, without having to start up an App. I always liked stuff like this when it was on movies featuring future, friendly tech. Always wondered why iGoogle, Yahoo Homepage, and other things like that died off. I guess they couldn't monetize it? I would pay to have this on my MacBook .... Apple TV? It's nice but I don't watch a ton of TV. Incorporate iCloud Calendar, Dark Sky, Biking Times, & auto turn off/on for the Apple TV (HomeKit?) so that I can wake up, it’s already on. Leave and it turns off approximately when I leave the house every morning to make it truly seamless and not burn into the screen. Great Job! Not bad, solid concept, needs some tweaks (a manual location setup probably ...) and some additional "widgets", this seems like something I'd leave running in the main TV space next to my office/kitchen.